Keeping your hair thick and healthy requires a constant supply of vitamins and nutrients stemming from a well-rounded diet. Consuming a diet that lacks the vital nutrients your body needs can lead to numerous health issues, but can a vitamin-deficient diet directly lead to hair loss? At Carolina Hair Center, we focus on real solutions for your age-related hair loss. With so many unsubstantiated claims about hair supplements and magic cures for hair loss, we understand how difficult getting to the truth can be. Dr. Jerry Cooley will sit down with you during a one-on-one consultation to evaluate your hair loss and all of your concerns before developing an effective and personalized treatment plan. Is There a Link Between Vitamin Deficiency and Hair Loss? Hair is made mostly of keratin, a type of structural protein that also makes up our nails and the claws and hooves of other mammals. In order to produce keratin and the essential amino acids that make up our hair, our bodies need a healthy diet rich in vitamins. Hair loss has been linked to a deficiency in many vitamins, including vitamin D, biotin, Vitamin C, niacin, zinc, iron and more. Deficiencies in biotin, niacin or iron have been especially known to contribute to hair loss. 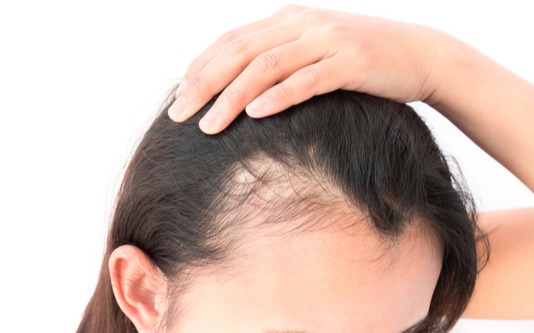 Unfortunately, while a vitamin deficiency can cause hair loss, it is usually not the main reason for thinning hair. The vast majority of hair loss is the result of our genetics which cannot be altered or supplemented using over-the-counter vitamins or by any other means. The level of a vitamin deficiency necessary to begin noticeably impacting your hair growth would also manifest in other, more severe symptoms, like skin conditions, brittle nails and illness. Vitamin deficiencies that lead to noticeable hair loss are very rare and would typically be apparent by other signs throughout the body. The amount of research connecting vitamin deficiency and hair loss is limited, and any hair loss supplements on the market are not properly regulated by the FDA. While it is possible that taking supplements for hair growth may help your hair grow thicker, the existing research is very thin and some studies have even shown that supplements can worsen hair loss by creating an excess of certain vitamins. If you do believe you have a vitamin deficiency, then focus on eating a well-rounded diet rich in foods like meat, leafy green vegetables, eggs, avocado, nuts, seeds, fish, dairy and fruits to naturally increase your vitamin intake at a safe and controlled level. Scheduling a blood test with your doctor to monitor your health can also reveal deficiencies in certain vitamins and help you make adjustments in your diet. Taking a daily oral vitamin can also help ensure you receive your proper nutrients for the day, without purchasing more expensive and unproven hair loss supplements. Fortunately, two proven methods exist for treating hair loss with verified results. The only FDA-approved hair loss products on the market that have been shown to successfully combat hair loss are minoxidil and finasteride. Minoxidil is found in the popular product Rogaine and can fight the follicle-killing effects of aging, helping you keep more of your hair for longer. Rogaine will not completely stop hair loss or regrow hair that has long since fallen out, but it can slow the process and help you maintain your hair in its current state. Propecia is an oral medication that contains finasteride. When used regularly, especially alongside Rogaine, Propecia has been proven to slow down hair loss and even rejuvenate hair follicles that have begun to stop producing hair. When used together, Rogaine and Propecia work effectively to target and fight the underlying genetic causes of hair loss. Neither product will cure your hair loss or reverse a receded hairline, but they are FDA-approved and used by millions of men and women throughout the world. If your hair loss has progressed beyond the hope of medication, then you may be a good candidate for hair transplants. Older hair transplant procedures resulted in a well-known and infamous “pluggy” look that scared many potential patients away from the treatment option. Modern hair transplants, however, have advanced greatly and can help you restore your hair without telltale or embarrassing evidence of surgery. Follicular unit excision (FUE) and follicular unit transplantation (FUT) are the two main forms of modern hair transplantation surgery, and both can be used to rebuild your hairline or fill in bald spots. During hair transplantation surgery, healthy hair follicles are harvested from donor sites in certain areas of the scalp. The harvested follicles are then transplanted one-by-one where they are most needed, with great care taken to ensure results appear natural and seamless. If you choose to receive hair transplants, you can expect to enjoy more youthful, thicker hair for years to come. Your transplanted hair will not fall out and can be washed, brushed and styled normally. Hair transplantation surgery will not stop your ongoing hair loss, however, and it is essential that you adopt an advanced hair care routine that utilizes Rogaine and/or Propecia to ensure your results are long-lasting. At Carolina Hair Center, we offer hair loss solutions from qualified professionals. Dr. Cooley is board-certified and widely-recognized among the hair loss community for his vital contributions in advancing modern hair loss treatment. He offers hair transplants, platelet-rich plasma (PRP) therapy and personalized care plans to patients interested in the latest advancements in effective hair loss treatment. Call us today at 704-542-1601 to schedule your consultation with Dr. Cooley and learn how Carolina Hair Center can help you restore your hair and your confidence.